Cygnett Workmate Pro is a Silicone Shock-resistant case for the iPhone 4. 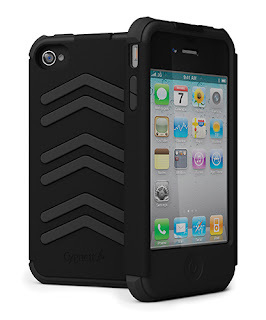 It is a heavy-duty case constructed of layers silicone & high-quality polycarbonate to protect your iPhone from falls. The slimline case provides extra protection without adding bulk. You can easily access all ports, controls & connectors and it includes a screen protector and microfibre cleaning cloth. James is very impressed with his new iPhone 4 cover, it fits really well and isn’t too bulky which is one thing he really hates! He hasn’t taken it off his phone since he got it so that really does say something as James is the pickiest person I know ;O) He really needed a good quality, protective cover as he goes out running everyday and has been known to drop his phone on numerous occasions! So he is happy that it is now well protected! Yes I believe I would like this!